"Synthetic Biology" is an emerging field of research of natural sciences that concentrates on the artificial production of biological systems using a modular construction system. The students at HLFS Ursprung extensively deal with the possibilities and dangers of "SynBio" in a school project. Therefore, a panel discussion about the ethics and security of this new field of research is being organised while the possibilities of SynBio are being tested in the lab. Dr. Nediljko Budisa from the famous Max-Planck-Institute and Dr. Markus Schmidt, leader of the EU-project "SynBioSafe", talk with the students about explosive issues: How far can the artificial production of synthetic systems go? What are the risks if, for example, viruses can be produced synthetically? However, also in the school lab respectable results can be achieved. The young researchers have already succeeded in inserting two synthetic amino acids into the enzyme amylase in order to change its structure and properties. Amylase is an enzyme used in industry on a grand scale that breaks down starch into sugar, for example in the production of bio ethanol. The students want to show that it is possible to modify complex biological molecules with the help of "SynBio" and, consequently, save immense amounts of energy in the near future. 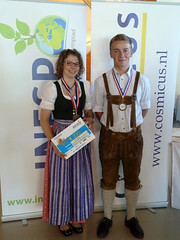 The students have already won the first prize at "Jugend innovativ" in the category "climate protection". They will present their synthetic amylase at scientific expos in London and Lisbon. Students can assess benefits and dangers of genetic engineering and "SynBio"